DB-11 Loop Expander, Other MIDI Controller from Decibel Eleven. Decibel Eleven unveils the DB-11 Loop Expander for the NAMM 2014. Decibel Eleven will introduce at the Winter NAMM 2014 a new Loop Expander that increases guitar rig effects switching capabilities. 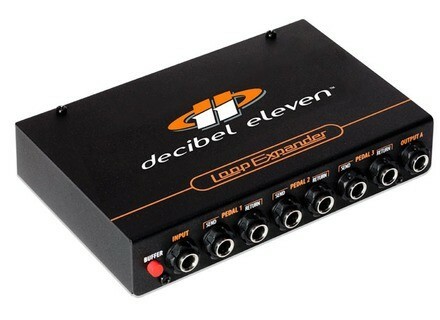 The Decibel Eleven Loop Expander is a true bypass audio switcher that adds programmable effects loop switching to any MIDI controlled setup. It can be used to add loop switching to any existing system with a simple MIDI controller, or to expand the number of true bypass loops with additional audio switchers. The DB-11 Loop Expander works with MIDI Program Changes or MIDI Control Changes. Additional features include four relay true-bypass audio loops, optional fourth loop as amp switch, and switchable Class A discrete input buffer, plus it can be mounted on a rack shelf or placed underneath pedals. The announced street price is $189. For more info go to www.decibel11.com. [NAMM] The Cubase iC Pro App on Android Exactly one year after the release of the iOS version, Steinberg announces the availability of its Cubase iC Pro app on Android.